I'm late with my Christmas Card post today, I'm sorry. Tonight I had a stall at the Starry Night Markets in Willoughby, so my last few days have been taken up with market stall preparation. I will post my Christmas Cards post over the weekend. Make sure you visit Mel's blog for her lovely card ideas, she has shared such beautiful projects. In the meantime, here are a few photos of my market table I managed to take before it got dark. I would like to thank my gorgeous daughter Emily for being my lovely market assistant tonight. I had a lovely night selling my ribbons, ribbon pouches and my fabric market bags. Thanks for visiting, I'll will be back over the weekend. 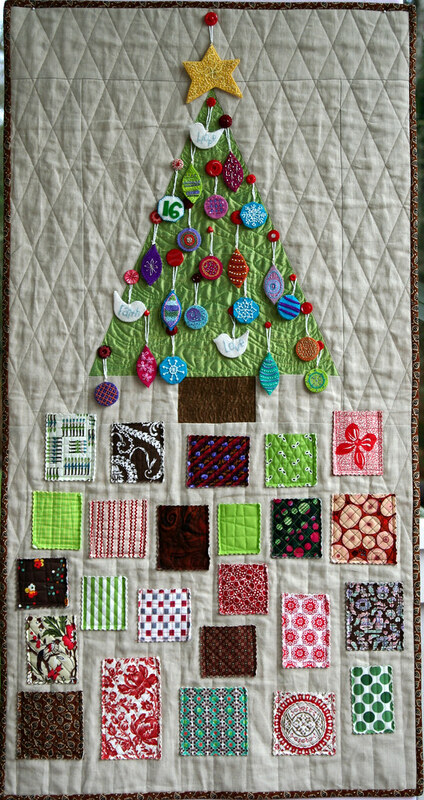 From now until Christmas Mel and I will be sharing some inspirational crafty Christmas projects and ideas. We'll be posting every Tuesday and Friday until Christmas. In preparation for the silly season, I created a Christmas-y blog banner, just to get me in the festive mood. Mel and I thought we'd start our festive ideas with a post about Advent Calendars. I wanted to find out a little about the history of the Advent Calendar. I knew it was a way of counting down the days to Christmas, but I wanted more.... Wikipedia to the rescue, this was one place that appeared in my search. A brief history can be found HERE. Since having children I (and my girls) have a tradition of choosing a chocolate filled calendar from the supermarket. My girls love opening their calendars every morning through December. Its the only time of the year they are allowed to eat chocolate before breakfast! And since having children I always had grand plans of making a calendar for each of them, something that would become a "long term" tradition. Last year I finally made two calendars. . I did share photos of these last year, but I didn't go into detail of how they were made, so here's a little more information (not a tutorial, but a few tips to making them). I didn't measure any pieces of fabric for Emily's calendar. The larger background pieces (front and back) are the size of fat quarters. I did machine quilt fabric I used in this project, but you can leave this step out, or just use a light batting to give the calendar a little substance. I created 4 large strips of fabric to go across the calendar background fabric. 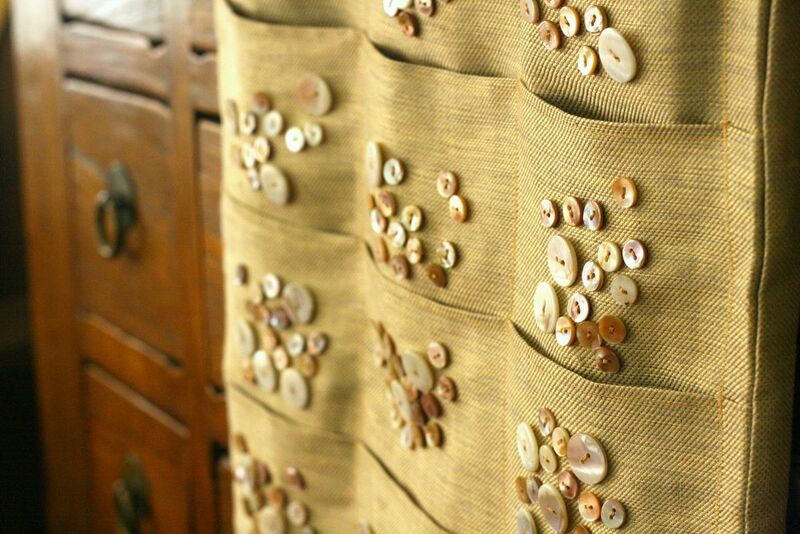 These were embellished with ribbons and rick rack. I sewed them to the front base piece only. I then sewed lines from top to bottom to create the smaller pockets. Six pockets were created across each of the four rows. The flowers and buttons were then added to the calendar. Now is the time to consider how you would like to hang the calendar. I made some fabric tabs and sewed them to the top of the calendar, leaving the tabs facing inwards before finishing off the project. The back of the calendar is sewn in place at the end... with the right side (pockets side) of the calendar and the right side of the back fabric together, sew around the edge, leaving a small hole to turn the calendar right side out. Stitch the hole closed. And your calendar is ready to be filled with little treats. Now I didn't add number to this calendar, we used a little decorative peg last year to show the number, and moved it along to each pocket. Phoebe and I made 24 quilted, fully lined stockings for her calendar. Phoebe did alot of the quilting herself. Now this seems alot of work, but set up a little production line to make the stockings and it's not such a huge task. The stocking pattern I used was from Martha Stewart. Any stocking pattern can be used, just ad adjust the size to what you require. Martha Stewart's stocking template can be found HERE. Her original project was made using felt which was very cute. There are good instructions there for making the stockings. Here's a few tips for making fabric stockings.... Cut out 48 stocking pieces (if making unlined stockings or using felt), cut out 96 stocking pieces if making lined stockings. Sew the stockings together. I sewed a front (quilted) piece to a front lining, then back piece to back lining. Then right sides together and sewed around the whole edge, leaving a small hole in the lining (near the heel of the stocking) to turn the stocking to the right side. Stitch the hole closed and stuff the lining back inside the stocking. I hope that makes sense, if not ask any questions. Unfortunately I don't have any photos of that step. Once finished, we pegged them up on string. Now all I have to do is fill them all with goodies and we're ready to another year of our Christmas tradition. I have found many more calendars on the web. 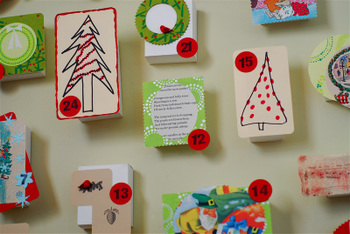 Some favourite handmade advent calendars from other crafters are below. Please click on the links to visit their blogs and instructions to creating their calendars. And lastly, one great place for creative inspiration is Flickr, one group to look through is the Creative Advent Calendars group. So many ideas all in one place! If you have a favourite advent calender idea, please share a link in the comments, I'd love to take a peek. Thanks for visiting, see you on Friday for our next installment of our Crafty Christmas ideas. ... I've just checked and it's been over 2 months since my last blog post. The days, weeks and (dare I say) months have just flown by. In October we took a trip overseas to our beautiful neighbour, New Zealand. We had a fabulous time staying in Christchurch, Lake Tekapo and Queenstown and driving through the most gorgeous countryside in between. I've finally uploaded our holiday snaps to Flickr, if you are interested you can take a look at them HERE. The family have kept us busy. Sport and music fill our lives. Phoebe's representative basketball season has come to an end, as has her regional soccer development squad . I have a new camera. I upgrated my Canon 300D to the Canon 500D. I'm loving it. It got a good workout when we went to New Zealand and I'm really happy with the results. The silly season has started over at Ribbons Galore. I sold some baubles and pouches at a school fair recently. The baubles will filled with ribbons and hung from tree branches. They looked so pretty. Unfortunately I have now SOLD OUT of the baubles for 2009. That's about all for now. Thanks for visiting. I'll be back with some festive news very soon, so stay tuned.